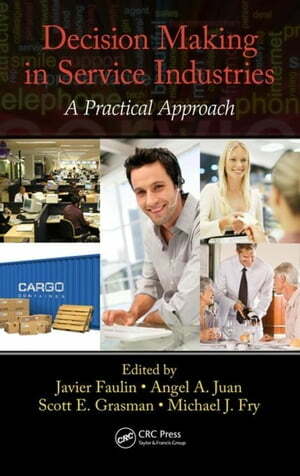 Collins Booksellers - Decision Making in Service Industries: A Practical Approach by Faulin, Javier, 9781439867457. Buy this book online. In real-life scenarios, service management involves complex decision-making processes usually affected by random or stochastic variables. Under such uncertain conditions, the development and use of robust and flexible strategies, algorithms, and methods can provide the quantitative information necessary to make better business decisions. Decision Making in Service Industries: A Practical Approach explores the challenges that must be faced to provide intelligent strategies for efficient management and decision making that will increase your organization's competitiveness and profitability. The book provides insight and understanding into practical and methodological issues related to decision-making processes under uncertainty in service industries. It examines current and future trends regarding how these decision-making processes can be efficiently performed for better design of service systems by using probabilistic algorithms as well as hybrid and simulation-based approaches. Traditionally, many quantitative tools have been developed to make decisions in production companies. This book explores how to use these tools for making decisions inside service industries. Thus, the authors tackle strategic, tactical, and operational problems in service companies with the help of suitable quantitative models such as heuristic and metaheuristic algorithms, simulation, or queuing theory. Generally speaking, decision making is a hard task in business fields. Making the issue more complex, most service companies' problems are related to the uncertainty of the service demand. This book sheds light on these types of decision problems. It provides studies that demonstrate the suitability of quantitative methods to make the right decisions. Consequently, this book presents the business analytics needed to make strategic decisions in service industries.